The mayor who spoke those words was not SF’s Ed Lee — it was Bill de Blasio, the new mayor of New York City. Coincidentally, Mayor Lee did issue a press release today addressing traffic violence, but unlike the message de Blasio sent at his press conference, Lee’s statements appeared to be aimed more at placating city residents who’ve been calling for safer streets than demonstrating a serious commitment to making that a major priority. Lee’s press release, which he did not hold a press conference to announce, touted a new SFMTA safe driving awareness campaign, an increase in SFPD traffic enforcement staff, and the SFMTA’s procurement of funds for planned traffic signal upgrades along Polk Street and South Van Ness Avenue — in 2017. A safe driving training program for truckers contracted by the city will also start in 2015. Pedestrian safety continues to be a key focus as our City grows. San Francisco is a City that walks, and we all have a shared responsibility to protect and care for the most vulnerable users on our City streets. By looking out for each other and by driving more slowly and carefully, we can make a big impact on improving safety for those walking in San Francisco. This new campaign will be culturally competent and will touch all corners of San Francisco. In NYC, de Blasio appears to be embracing Vision Zero, announcing a working group led by the city’s police, transportation, health, and taxi commissioners that is tasked with coming up with an action plan by February 15. The most comparable action in SF is former Mayor Gavin Newsom’s Executive Directive on Pedestrian Safety, which established the Pedestrian Task Force in December 2010, leading to the Pedestrian Strategy released more than two years later. Lee did form the T2030 Task Force, which recommended three ballot measures to partially fund general transportation improvements, but even if they pass, they’re not expected to fund the drastic increase in pedestrian safety measures needed. More importantly, Ed Lee has said nothing about the calls from supervisors and safe streets advocates to pursue Vision Zero, or the lives devastated by reckless driving. De Blasio said that NYPD will increase the size of its highway division — which investigates crashes and performs much of the department’s traffic enforcement — by 50 percent. He also reiterated campaign pledges to roll out safety redesigns along dozens of streets each year, and to press the state legislature to allow NYC to greatly expand its automated speed enforcement. Meanwhile, Mayor Lee announced a 12 percent increase in the SFPD’s motorcycle-riding Traffic Company. It’s unclear if that’s actually a new development, as SFPD officials have said they’ve been working to replenish the Traffic Company and overall police staffing for months. Lee’s press release also says SFPD will follow its “Focus on the Five” campaign, targeting enforcement at the most dangerous intersections and driving infractions, but the department has supposedly been doing that for well over a year now. No data showing the SFPD’s performance on that program has been released yet. Enforcement of traffic laws continues to be a critical piece to improving pedestrian safety. Enforcement educates drivers about the rules of the road. One of the most effective ways to reduce serious injuries and fatalities has proven to be through targeted enforcement. It is with this in mind that we came up with our ‘Focus on the Five’ strategy where we have been focusing on the five most dangerous intersections in each of our 10 police districts, ticketing for the violations most responsible for collisions. We are committed to keeping our residents and visitors safe. Still, we haven’t heard Suhr make any statements comparable to that of NYPD’s newly-appointed police commissioner, Bill Bratton, who acknowledged the department’s pattern of botched pedestrian crash investigations. A similar pattern has been seen in SF, as a Board of Supervisors committee will address at a hearing tomorrow. “Many, many serious accident investigations involving serious injuries were not adequately investigated,” Bratton said of the NYPD. As we noted, Lee is also touting the SFMTA’s procurement of a $2.9 million federal grant to upgrade traffic signals, install pedestrian countdowns, and build ADA-compliant curb ramps along Polk and South Van Ness. Any pedestrian safety improvement is positive, but this sounds like the mayor is arbitrarily highlighting a relatively minor and routine pedestrian-related project development, based solely on the timing of his bid to manage political furor. And, as we also noted, those improvements aren’t even coming until 2017. Not exactly the swift action to curb the rising tide of reckless driving the city needs. Perhaps it was prudent, then, that Lee didn’t take a tack similar to de Blasio and make his announcements at Polk and Ellis Streets, where 6-year-old Sophia Liu was killed after being run down, along with her mother and brother, in a crosswalk while they had a green light. If Lee wasn’t prepared to make a serious case for safer streets, he would risk embarrassing himself. Unfortunately San Franciscans face a very real risk every time they’re on the streets: being run over by a reckless driver. And we may have to wait until the next mayoral election for that to change in any meaningful way. Some people get the fact that traffic violence is an urgent public health and safety problem that is very preventable, and some don’t. Ed Lee doesn’t get it. And then Lee says he wants to reinstate free parking on Sunday! Oy! They would have determined that all 4 of the people killed were at fault if the SF Bike coalition hadn’t gone out and found video of the collision that killed Ms. Le Moullac’s. I have absolutely no confidence that the police are correct in this matter, particularly for the elderly man run down by the MUNI bus while crossing Division. Let’s not forget that the bus that killed him didn’t have the required safety equipment installed which contributed to his death by catching him in it’s wheels. Once again, by blaming the victims for their own deaths, the city conveniently finds scapegoats for why they don’t need to act more quickly and spend money and political capital to change the configuration of our streets. In addition to the man run down by a MUNI bus crossing Division, the other three deaths were: Amelie Le Moullac killed by a right turning truck, Dylan Mitchell, killed by a Recology Garbage truck turning right from 16th onto Van Ness, and Diana Caroll Sullivan, killed by a cement truck that ran over her on King Street at 3rd, where sharrows disappear 1/2 a block from the intersection. https://medium.com/improving-our-cities/1456bbd017d9 To pass blame on each of the individuals in addition to Amelie Le Moullac is the height of hypocrisy on the part of the police department. On December 31, a six year old named Sophie was killed by a reckless driver. Was it really her fault for crossing the intersection? If traffic laws and respect for human life didn’t stop it, how does asking drivers politely to follow the law change that? Close to ten years ago another public awareness campaign installed those “look” signs at crosswalks. Because an awareness campaign completely solved the problem and no pedestrians have been hit since, isn’t it just a waste of money to launch another awareness campaign for a problem that was completely solved already? Politicians are fundamentally intermediaries between the people living in a political demographic unit (sometimes known as constituents, other times known as “the masses”) and the wealthy people/corporations who have strong economic interest in controlling the laws and policies of said political demographic unit. Ed Lee very obviously does little because he personally thinks it’s a good idea or bad idea. He is not mayor because of any vision he has whatsoever. He is in place because he is useful to the people who got him elected. The people who got him elected are a coterie of very wealthy people/corporations who contributed to his campaign via political action committees, as well two very powerful people in San Francisco politics (Rose Pak and Willie Brown) who who are clever enough to orchestrate and trade favors with wealthy/powerful people. 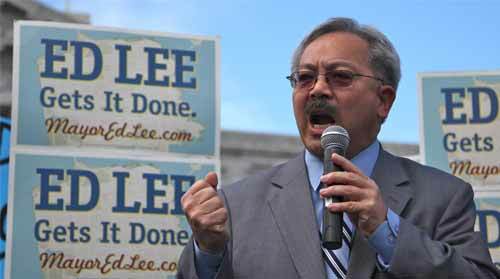 In the 2011 mayoral campaign, Ed Lee outspent his opponents two to one. His large campaign contributors via PACs (at least ones that were not hidden through various forms of campaign donation subterfuge) were Marc Pincus of Zynga ($25,000), Marc Benioff of Salesforce.com ($75,000), Sean Parker of various fame ($100,000), Ronald Conway venture capitalist ($151,000), Haiyi Hotels ($30,000), PG&E ($20,000), Business Owners Management Association ($50,000), San Francisco Association of Realtors ($160,000). To get change in San Francisco the above group needs to be convinced that more prosperity and a better chance at continued peaceful social order is possible via a San Francisco that allows for safe and convenient walking, biking and transit. If the above people/corporations feel that car use is more profitable (or, in Pak and Brown’s cases, will gain them more political power), then very little will be done to alter our car-dominant transportation system, even if Lee came out tomorrow with his own Vision Zero with lofty goals and vague promises of changes in policy. As to de Blasio and New York, actions will speak louder than words. The only explanation I have for police blaming 3 of the 4 cyclists for their own deaths: none of the other three had sufficient social status to matter to politicians, the press, or the general public. One was a young man peddling to a working class job since finishing trade school. Another was a woman near age 50 with an alternative life style involving peace, artwork, and butterflies, etc. The third was an elderly Chinese-American man who collected large bags of cans for recycling. Each of these victims was too easily dismissed by anyone willing to fall back on blaming the victim and therefore not having to recognize the terror of “That could have happened to me or my child.” The man could be written off as a young,reckless speeder; the woman near fifty, as kind of loopy; the Chinese junk collector, as too old and culturally out of touch to understand American traffic patterns. The problem is not just the absence of enough traffic surveillance cameras. It is the absence of respect and care for those without social power. Karen, while I understand that you may dislike the policies of Ed Lee, I do not think that you make a leap from there to an allegation that most SF residents do not. Lee gathered 50% more votes than his nearest rival in the mayoral election, and approval ratings for him in polls have always been over 50%, and have been as high as 73%. an allegation that most SF residents do not. Don’t forget that turnout was 43 percent. Most SF residents simply have no clue. For all the time we spend blathering on these blogs, the majority of the citizenry is completely disconnected from City politics. If you walked down Union Street and did a quiz, 20% could probably not even name the Mayor. 50% probably don’t know their Supervisor’s name. And that’s why the money is so good at winning elections. Name recognition is everything for a disconnected electorate. To be accurate, Ed Lee received 59,775 votes in the first round of the 2011 election out of 197,242 votes cast. 137,467 people (70% of those voting) did not vote for Ed Lee as their first choice. As murphstahoe mentions below, 267,158 registered voters didn’t even vote. So out of 464,380 registered voters in San Francisco, Ed Lee garnered the support of of 12.9% as top choice. After twelve rounds of gathering up second and third place votes as other lower vote-getting candidates were eliminated, he still had only achieved the vote of 18.2% of registered San Francisco voters. However, this was enough to win that election. I instinctively like ranked choice voting but it didn’t work out so well. Even though I’m pretty sure Avalos loses a runoff, it would have made for a focused campaign. We might get such a campaign next time as third tier candidates with no hope will have more trouble getting any traction.